A deer chaser water fountain is a mobile sculpture found in many ornamental meditation gardens. Japanese meditation gardens incorporate the sounds and movements of water, birds, insects and plants to create layers of peaceful sensory charm. Trellis boxes, flat boulders and log or stone benches provide seating. Fill the circulating pond at the base of the deer chaser with a variety of koi fish, turtles, frogs and toads. Usually made from bamboo tubes, a deer chaser water fountain consists of a large, wide tube fed from an artesian spring or a circulating pond with a submersible pump. 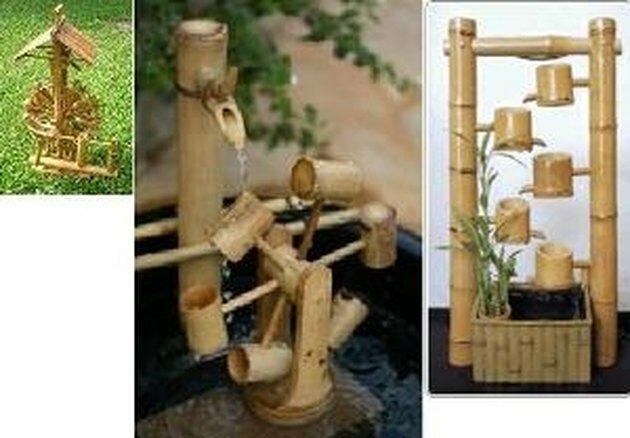 The catch tube is attached on a pivot point between two thin horizontal bamboo pipes. One pipe is about one third from the top of the catch tube while the other is about 6 inches from the bottom. Water from a smaller tube above the catch tube fills it and causes its center of gravity to shift. The catch tube falls forward and spills its contents into the catch basin of a circulating pond. Once empty, the tube springs back into its original vertical position and thumps against the lower tube. The irregular rhythm created by the tube as it fills and empties startles the deer, although not for long. Place a series of deer chaser water fountains down a hillside to provide power by spilling into various spinning, whirling and rolling mobile sculptures. The various parts will have to be reset by hand each time the water makes one entire circuit, though, in order to continue to enjoy its effects. Place a gazing ball in a 6-inch diameter shallow trough at the base of your first deer chaser water fountain so that the force of the catch tube's return to vertical dislodges the ball and sets it rolling to the next piece. The ball then passes through a series of gates with paddles which dislodges a toy car down a slide. The toy car will dislodge a second gazing ball, allowing water to flow into the next deer chaser water fountain's catch tube. Continue the fun by placing a series of wind chimes above the path of the next ball, low enough that it will hit each one as it travels along its path. Add any other touches you desire. Include a variety of moving parts, clattering, ringing or chiming sounds, and brightly colored, spinning and rolling parts.